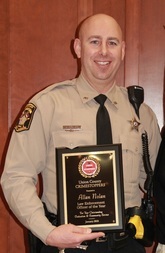 Union County Sheriff's Deputy Allan Nolan was awarded January 2016 for his professionalism, integrity and dedication to law enforcement and the community. ​He has compassion for all Union County residents and exudes an attitude and behavior that radiates to the public, supervisors and co-workers. He has been known to stop and help change a tire in 100* heat, stop on his day off and help the elderly work in their yard, pay an electric bill for someone in need or shop for food for someone who was hungry. He says, I want to help people whether I am in or out of uniform. 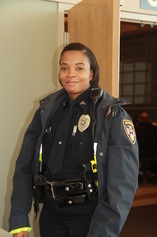 Monique Holt is a member of the Monroe Police Department and a school resource officer at Monroe Middle School. She takes her job seriously and is dedicated, not only to the safety of the students while they are at school, but takes it a step further by being a mentor to so many. " I enjoy working with my kids and the people in my department," officer Holt said. Wingate Police Chief, Donnie Gaye, received top honors at the 2013 Crime Stoppers BBQ on January 17. Gaye took the office of chief in July of 2012 with twenty years in law enforcement experience. The town manager said after Gaye took office the Town of Wingate was transformed from no involvement in the community into an organization that cares and really wants to improve its stance in the neighborhood. In August he organized a job fair with 15 employers and 75 plus job seekers. He organized a coat drive for children, worked many hours with the Christmas Bureau and Kiwanis of Monroe to collect food and then distribute it families in need. He is often seen in the local elementary schools talking about responsibility and other character traits, Halloween safety, bicycle safety and anti-drug campaigns. Along with running the department he still oversees investigations and frequently works cases to make the town safer. Instead of passing the buck or delegating, he takes these cases to heart and see them through to the end. He works with Wingate University to improve the quality of life, solve crimes, and prevent future crimes. He holds weekly meetings with residence life directors and their staff to address the needs of student life, reduced victimization, reduction of alcohol related incidents, and establish communication with the administration, students and law enforcement. Chief Gay worked with the NC Justice Academy to develop a lesson plan on officer involved domestic violence from the perspective of the victim, an officer and a male. The lesson plan and video will be taught to police officers across the state of NC. Gay shows strong leadership, positive change in the community, crime prevention strategies, and compassion for people. Union County Crime Stoppers is proud to announce the 2012 recipient is James Kirkley. Pictured above is his family accepting the award f﻿﻿or Police Officer of the Year. Kirkley recently died after battling brain cancer. He was a member of the Union County Sheriff's Office for 25 years. Kirkley spent half of his life as a deputy and did a lot to serve the community. James began his career with the Union County Sheriff's Office as a Detention Officer in August of 1988. Soon after this, he completed BLET (Basic Law Enforcement Training) and was sworn in as a Deputy Sheriff. James held many assignments during his career and was well known for his excellent service in each one. He held positions in the Jail as well as Patrol Division, School Resource Officer, Community Deputy, Civil Bureau, and Court Security. He obtained both his Intermediate Law Enforcement Certification and Advanced Law Enforcement Certification and was promoted to Corporal in 2001.